My dog's irises depigmented over a couple of weeks time when she was almost 1 1/2 years old. She is a rescue pup, probably an Aussie cross. Do Australian shepherds typically start brown, like my April's, and then suddenly depigment in maturity? Thank you for your question regarding changes in dog eye color. 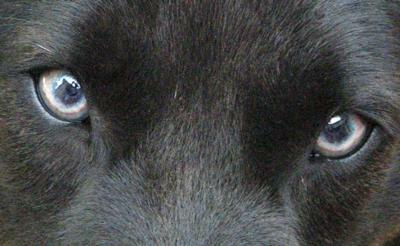 Dog Eye coloration is a genetic characteristic, which is transferred from parents to off-spring. However, in Australian Shepherds, there are relatively more variations related to this phenotypic character. Usually, Australian Shepherds may have either blue or brown eye color, but in some cases this may be either mixed or in other cases the color of the eyes might differ from each other. In either case, if the dog is not suffering from any congenital dog eye problems, this character is considered normal in any dog, especially for Australian Shepherds. So, in the case of Australian Shepherds, it is normal that eye color changes over time. You cannot term it as “depigmentation”, since this a genetic character of this breed. Also, usually a change in dog eye color may occur in the initial 6 months of age, but this may happen later on, especially in dark coated dogs, such as this case. From the picture you provided, though we cannot assess it completely because of the flash of the camera, the environment can cause changes in eye texture, but these dog eyes appear to be normal eyes that have undergone a normal change in eye coloration, which is a normal event for Australian Shepherds. This variation is considered a positive characteristic of Aussies. It is important to also remember that there are various canine eye health concerns that are also related. For example, dogs that have undergone a change in eye color and coat over time and/or due to genetic characters have relatively sensitive eyes and are more vulnerable towards eye cancer. Therefore, it is better to keep a close eye over the eye health of your dog. At a minimum, the eyes should be regularly cleaned and any unusual symptoms should be referred to a nearby veterinarian. For regular dog eye cleaning, it's better use eye cleaning pads such as R-7 Sterile Dog Eye Wash Pads and a natural remedy such as Eye Heal, to maintain dog eye health and to enhance immunity. Yours is the first response to assure me that my little black pup is normal to lose the brown pigment in her eyes after her first birthday. If anyone is interested, I can post more photos.